In 1991, the Uranium Council of India Limited (UCIL) first started drilling in the state of Meghalaya, after the Atomic Minerals Directorate (AMD) found uranium in the Domiasiat area. But in a couple of year’s opposition to the project started mounting up. Hoping Stone Lyngdoh, a legislator in the Hill State People’s Democratic Party (HSPDP), is remembered as one of the first to have studied about uranium mining, and then rallied people to oppose it. Khasi Students Union (KSU) was another resistance group. In 2017, the Khasi Hills Autonomous District Council (KHADC), which represents the region’s autonomy per the Sixth Schedule to the Constitution, withdrew the ‘No Objection Certificate’ issued to the company. I visited Meghalaya in May 2017, and most people I spoke to vehemently opposed the project. But there were some who felt mining would have brought development to the State. “Rightly or wrongly, I don’t know for sure, but the people of Meghalaya in general and Khasi and Jaintia hills, in particular, have been made to accept that mining of uranium will cause a deadly health hazard,” he said. I tried to contact UCIL and AMD for interviews but I was told the UCIL chief was travelling, and AMD did not respond. There is one part of the project which interests even many of those who are staunchly against mining. This is the 68 km Nongstoin-Pambriew-Wahkaji-Mawthabah stretch, which UCIL was to make into a two-lane road. Many among the general public had waited eagerly for this as it would have connected remote areas to the more developed ones. With the company currently out of the picture, this too has come to a standstill though the council has now taken up the task. KSU members accompanied me to Domiasiat in West Khasi Hills, around 130 km from Shillong. Though nobody else I had met had met earlier had mentioned this, KSU said they found it safer to go in big groups as the area has insurgents and there had been some recent kidnappings. Once we reached Mowronong viewpoint, the road started disintegrating. The conversation inevitably turned to the subject at hand. Pulljohn Wannianj was clear, ‘Constructing a two-lane here can mean one thing and one thing only: mining. If it’s repair and proper road building for the sake of development, we would have been ok with that’. As we neared Domiasiat, we came across the abandoned buildings where workers employed at the mining sites would have stayed. 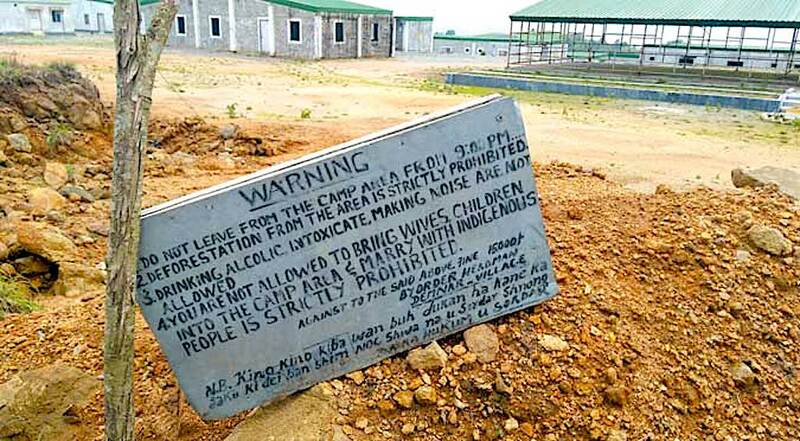 Near the entrance, a sign warned against leaving the campus after 9 pm, deforestation, alcohol, noise, bringing wives and children, and marrying indigenous people. The last bit reminded me of how some of the people interviewed had said that the main fear of the people (including KSU who have also been against railways) opposing mining was that of outsiders coming in. Going further into Wahkaji, another abandoned construction is the primary health center that was supposed to function while UCIL conducted its operations. I was informed that after one point cars cannot go in and we would have to trek through the forest for about thirty-forty minutes to reach the site. The jeep almost miraculously made its way through the rugged terrain to the point where the forest began. We started walking, trying not to be slowed down by the mossy stones and brambles. The now-closed drilling sites shown to me seemed like big water tanks almost at ground level, now cemented and covered. What bothered people were the many cracks that had appeared. Where repairs had been undertaken to fix them, after people’s protests, they had not been to people’s satisfaction. Phulchand said, ‘If there are cracks there would be a leak. I’ve read that concrete can’t stop radioactivity’. The other thing that made them uncomfortable were open pipes that apparently had been installed to release effluents. KSU people took care not to fill water in their empty bottles from streams around this area and kept insisting I cover my face with a mask even in the heat. Our next stop was the house of Spleity Langrin, an elderly matriarch, around 90, who has become the face of the anti-mining resistance. She said, ‘If it is about asserting my right over my land, I can do it any number of times. We belong here and we won’t give up our land till death’. Her daughter Silnola Langrin describes the various health effects due to mining that people, especially women and children, of the area had to endure. ‘One of them died at childbirth. My sister suffered too’. However, there are people willing to sell their land to the company. KSU admits that in the Nongjri area many people did not want to talk to them because they were upset with KSU for opposing mining. KSU said in these families too there were children born with deformities but the parents were not ready to see uranium mining as the cause. Karmel Thongni, a resident of Wahkaji. Karmel Thongni, 45, is another resident of the Wahkaji area. ‘We definitely oppose mining, though people in villages supporting it are upset with us’. This area is so cut-off. What kind of development would be most helpful for people here? Karmel laughed, ‘I don’t even know where to begin’. Around 60 km away from Shillong is the village of Laitduh in Sohra. UCIL had first made its presence felt here around 2003. The village secretary, Jingkyrmenlang Lyngdoh, showed us the old drilling holes, some of whose locations he remembered. Some of the rusted metallic pipes in the ground had their mouths open. Villagers feared such places might still be radioactive and could then contaminate the air and the water. Some others were just holes in the ground. At places they had been partially covered with big stones or cement lids, bearing the initials of the village. There were also spots which looked as if they were well covered by these lids but they could easily be lifted, exposing the holes. Richmond Kharmalki, a construction worker, said if mining took place it would turn out to be another Jaduguda (in Jharkhand) where UCIL’s mining of the ore is known to have caused serious health hazards for the people. Golden Star Kharchandy added, ‘Since we have not been told by the government about what exactly the effects of the mining could be, people are scared’. To the development question, Apilattues Kharchandy’s answer was, ‘First people have to know what sort of development is being talked about’. Apilattues continued, ‘In 2003, the company had taken the village’s permission only for a survey but they also conducted drilling’. One of the men present remembered carrying a machine for the team as a teenager. The company officials were seen taking some rock samples. But none of the villagers recalled any official having spoken about what exactly they were doing. Women in Sohra shared their reservations about uranium mining. In the year 2015, Damil Bynnud, the district KSU President, had read in the papers about the AMD’s plan to come to the area and had told local people about it. They had a meeting attended by about 300 people and had decided that they would approach the CEM of KHADC to prevent the AMD from coming. The local residents believed that after UCIL’s initial work in the area, even though it had not continued, some villagers had developed cancer and tuberculosis. I asked if such diseases did not happen earlier. ‘No, but we think in these cases it was the air from the open drilling holes’. In an interview, the CEM of KHADC, P.N. Syiem, asserted, ‘The MoU we had with UCIL was only for the road. In 1993, they had been allowed some construction. But some paragraph in it talked about mining which we missed. Anyway, now the MoU has been withdrawn’. What happens now to the two-lane project proposed by UCIL? ‘At times there are so many complications. The outgoing CEM had opened a joint account for KHADC with UCIL for this project. First, we had to close the account’. The CEM was perplexed that despite the council’s supposed autonomy so many nods still have to come from the State government before decisions can be taken. ‘We have asked the government for an NOC to repair the road as 18 km of work has already been done by UCIL of a total of about 70 km. Once it comes through work would be resumed’. “Open drill holes are generally not assumed to be a problem. But if there is water coming out of the hole, there is risk of contamination,” some experts say. Professor Om Prakash Singh teaches in the department of environmental studies in the North-Eastern Hill University, Shillong. When I raised the point of people’s concern over open drilling holes, he said, ‘That is a genuine point. When it rains, the same uranium goes downstream and during drilling the chances of leaching (which could release toxic effluents in the environment) increase’. In 2004, Singh was part of an environment impact assessment (EIA) group and had visited the concerned areas in Meghalaya. ‘The area-the flora and the fauna-seemed normal. The method involves generating baseline data which is later compared to the data of that place after mining is done. We can predict possible adverse effects and the mining company has to follow guidelines on the basis of which clearance is given’. Do companies adhere to these guidelines and is there a strict check on them? ‘The state pollution board is supposed to get regular reports from them but, yes, I would say that implementation is not done properly’. What about the safety measures for the workers on the site? ‘Those too have been neglected in our country in the past; it’s true’. Craig Hart, associate professor in the Department of Earth, Ocean and Atmospheric Sciences at the University of British Columbia (UBC), shared in an email interview, ‘Generally, open drill holes are not a problem. The only issue would be if there was water coming out from it, as it could cause an adjustment in the water table’. The chair of the grand council of chiefs of Meghalaya (Federation of Khasi States), John F Kharshiing, has been active in mobilizing support against mining activities: ‘We should focus more on other advanced technology rather than atomic power. Look at the cyber attack on Russia; everything happened through computers’. Coming back to the uranium-rich areas in question, he recalled a British map that shows the presence of thick forests and special birds in the region that could get endangered. He also mentioned proximity to international borders and the requirement of huge amounts of water in the process of mining. ‘If the centre tries to forcibly do anything here, they would have a Kashmir like the situation at hand’. The issue of uranium mining in Meghalaya is fraught with the resistance of student bodies and NGOs; the tensions between the State, the district council and the tribal chiefs; and the concerns of the people about land ownership and displacement, health, environment, and the true purpose of nuclear energy. One recurring question to emerge is whether mining is the mandatory cost people have to pay in order to be the benefactors of some much needed development, including the basic services of roads and electricity.